BHP Billiton has called off its bid for rival miner Rio Tinto, blaming falling commodity prices and regulatory demands that it sell off assets. The firm said the call had come from the European Commission, which had been due to rule in January on whether the two Anglo-Australian firms could merge. BHP said the Commission was calling for it to sell off certain iron ore and coal businesses to get the go-ahead. BHP's offer was worth $66bn (£44bn) based on Monday's closing share prices. In February this year, when BHP made its original offer, the all-share bid had been worth $147bn, but the value of the offer has declined as BHP share price has fallen. The news that BHP had scrapped its bid sent shares in the firm up 15% to 1129p on the London Stock Exchange, but Rio Tinto's shares plunged by nearly 40% to 1498p. Rio Tinto said in a statement it would "continue with its strategy of operating and developing large scale, long life, low cost assets to generate significant value for shareholders". BHP Billiton chief executive Marius Kloppers said that recent global developments and falls in commodity priced "altered risk dimensions." "BHP Billiton is very focused on balance sheet strength. Accordingly, the greater debt exposure of the combination plus the difficulty of divesting assets have increased the risks to shareholder value to an unacceptable level," Mr Kloppers added. Global commodity prices have fallen back sharply since record highs in the first half of this year. Prices have fallen as demand has been hit by the global economic slowdown. Most analysts say they were surprised by BHP 's decision, adding that it was good news for steelmakers. "Now that raw material prices have plunged, BHP sees no merit in a costly merger," said Mitsushige Akino at Ichiyoshi Investment. 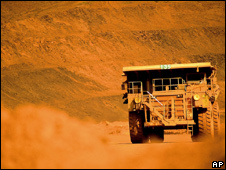 "BHP's bid drop for Rio Tinto is positive in that it will not bring about more worries of an iron ore pricing cartel," said Yang Ki-yeon at Daewoo Securities.